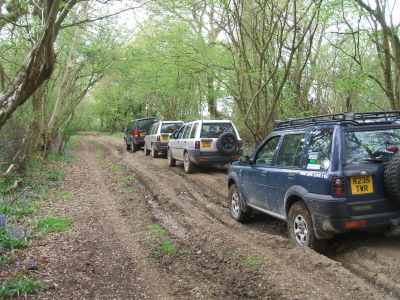 Green Laning is a commonly used phrase to describe the driving of vehicles on the unsurfaced public highways of this country. This is no different than the daily activity of every other motorist, however, it is just that the “Green Laner” chooses to drive generally on un-surfaced roads which are mostly inaccessible to ordinary cars. A ‘green laner’ is a Land Rover enthusiast who is in-tune with nature, they will typically already enjoy the outdoors and the countryside. They may have used their Land Rover, Range Rover or Discovery for driving in the countryside before, but never normally venturing off the tarmac. Owning such a vehicle means that places out of the reach of the “ordinary” motorist may be explored and enjoyed. This does not involve “Rambo” style assaults on the countryside. When green laning, winching should never be required, and mud plugging is not a necessity. Choose your route carefully and it may be enjoyed by the whole family, and in a largely standard Land Rover vehicle. Contrary to the comments of those trying to ban green laning, most lanes actually benefit from being used, otherwise they will become overgrown and lost to even horse riders and walkers. Some lanes may however, already be over used and these should therefore be avoided. There are several classes of road that can legally be driven. Some roads roads are known as BOATs. This is Byway Open to All Traffic. Other classes that are legally driveable include UCRs (Unclassified County Roads) and some RUPPs (Roads Used as a Public Path). We have our own Green Lane Officer who organises and monitors club green lane events throughout the year. Always popular with club members, these events take place over one, two or three days in the Lake District, Yorkshire Dales, even the Isle of Man! We travel in several groups of no more than four vehicles per group, each group has an experienced group leader who explains the do’s and dont’s and keeps everyone in check! Preparation is similar as for an RTV, with recovery points front and rear, a rope and fire extinguisher. You will also need warm clothing and sustenance for the trip!